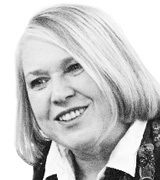 September 07, 2018, 3:30 p.m.
As the Special Counsel’s investigation of possible interference by Russia during the 2016 presidential campaign continues on, the successful prosecution of Paul Manafort has received bipartisan support: Americans in the latest Economist/YouGov Poll, whether Democrat or Republican, believe the Trump former campaign manager is guilty of the crimes for which he was convicted, and there is little support for Manafort receiving a presidential pardon. Just one in ten say Manafort should be pardoned, while nearly half say he should not. 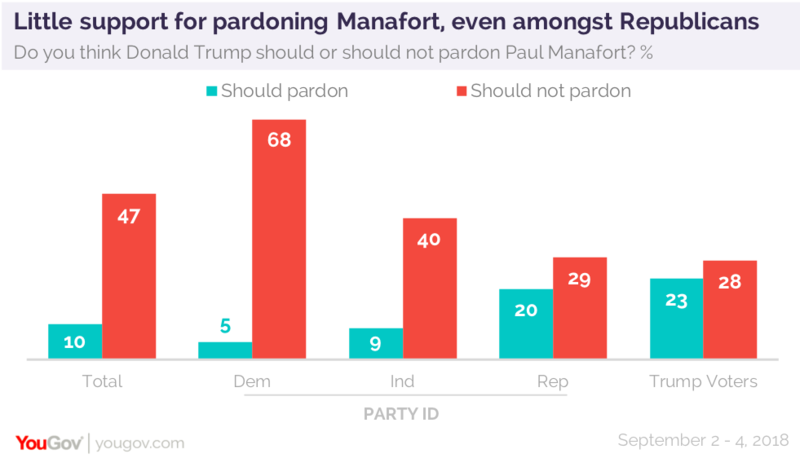 While support is higher among Republicans and Trump voters, more in both groups reject a pardon for Manafort. The Manafort conviction, however, has not resolved all partisan doubts about Special Counsel Robert Mueller’s investigation. 79% of Republicans continue to say the investigation is a “witch hunt,” a term the President himself has been using to describe it for some time. However, Americans approve of the investigation itself by a sizable margin, although Republicans disagree. By a smaller margin, the overall public also approves of the way Mueller is handling the job. Again, Republicans disagree. In the last several months several Economist/YouGov Polls have shown a smaller spread between public approval and disapproval of Mueller’s performance. There may have been a little jump this week in support for Mueller. This week, Americans – narrowly – even have an overall favorable opinion of Mueller: 35% are favorable. 28% are not, with many unsure. About half the public believes there were crimes committed by Trump staff members, both during the campaign and after the January 2017 inauguration. Fewer think the President himself did anything illegal either before the election or after the Inauguration. About one in five aren’t sure, and the rest say he did not. Only one in ten Republicans believes the President did anything illegal; more believe staff members did, but far more think they did not. For the President, the combination of events in recent weeks, including the Manafort convictions, have pushed back some recent gains he has seen in American public opinion of him. In the last few months, the President’s approval rating had stayed above 40%. But not this week. Just 38% approve of how he is handling his job, and a majority disapproves. It continues at the lower level within the same narrow band it has remained in for most of his time in office, varying from a few points below 40% to a few points above 40%. Similarly, this week only 36% of the public holds a favorable opinion of the President. 56% are unfavorable. A majority of independents are unfavorable. This is the lowest favorable rating for the President since last November. It has dropped six points just in the last week.